Dredging Dock Basin in front of Berth No.9 at Tuticorin Port reclamation behind the Cargo Berth No.9 with dredged soil. 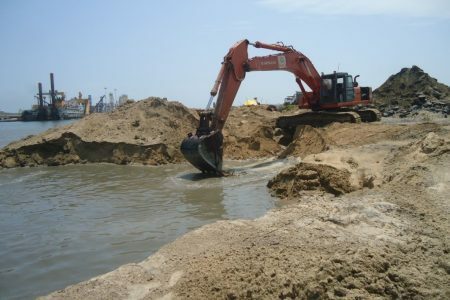 Dredging of Dock Basin in front of berth No.9 of Tuticorin Port Trust. Controlled under water blasting to reduce impact and vibration to existing structures of dock and working harbour. DDIL deploys Backhoe Dharti XIV to dredge Dock Basin to achieve -11.90m below CD including 243,000M3 of rock and 42,000M3 of soft soil / overburden. •Jet probing to ascertain the rock levels with water pressure of 7.0 kg/Sq.cm with standard nozzle. •Rock Drilling through grid system at spacing of 2m x 2m till depths desired and blasted through controlled explosions. Impact of blasting measured in Peak Particle Velocity (PPV) and maintainyed at safe levels. 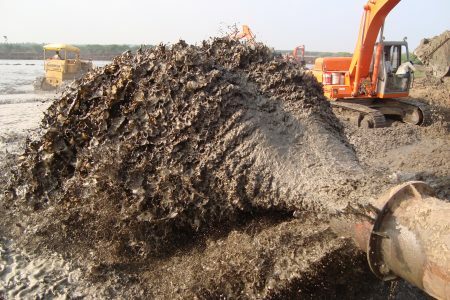 •Dredged 243,000M3 of blasted fragments (rock lumps / blocks) and disposed to eclamation areas behind Cargo Berth No.9 through flat barges and offloaded by shore excavators. •Backhoe Dredger equipped with real time dredge monitoring and data acquisition system to display top and side views of dredger outline along with the dynamic position of the bucket for efficiency. •Controlled under water drilling and blasting techniques carried out under the upervision of Indian School of Mining, Dhanbad. DDIL completes project in compliance with high standards of safety.